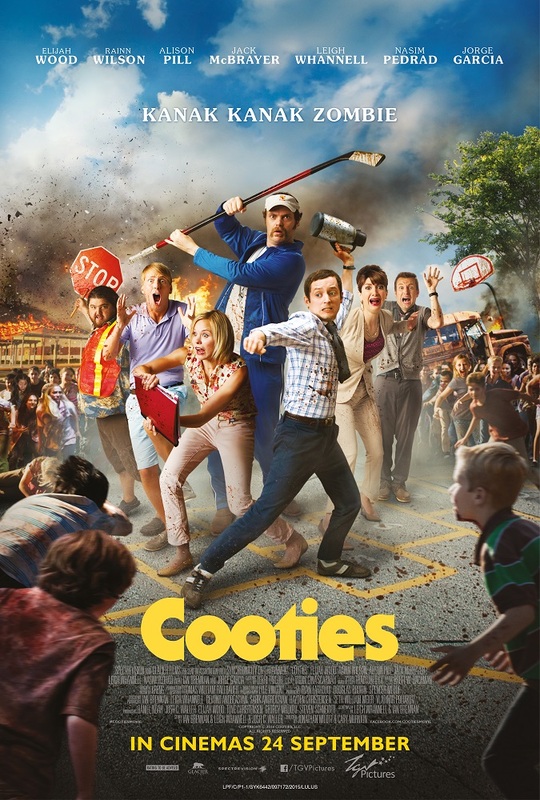 Based on a western children’s tag game (almost equivalent to Ice and Fire or Police and Thief “catching games” in Malaysia), Cooties is a star-studded horror comedy set at an elementary school in a fictional small town called Fort Chicken where young children gets infected with a disease and becomes violently aggressive for human flesh, basically like zombies but the movie can’t admit it. So buckle up and enjoy watching grownups brutally beating misbehaving undead kids to death. Survivors with distinctive stock-character personalities must find a way to escape from the school to safety, although anyone who’s gone through puberty would only get minor illness like nausea and diarrhea if they’re bitten or scratched. The Lord of the Rings‘ Frodo, Elijah Wood plays Clint Hadson, an aspiring horror novel writer who left town when he was young and returns to take up a substitute a teacher at the school. He reunites with his childhood crush Lucy McCormick (Allison Pill), a cheerful teacher who currently has a boyfriend who’s also a teacher at the school, Wade Johnson (Rainn Wilson), who’s the typical big size, unfriendly touch guy teaching P.E. The cast includes TV comedians like SNL‘s Nasim Pedrad, Late Night with Conan O’Brien and 30 Rock‘s Jack McBrayer, and Becker and Lost‘s Jorge Garcia, all wasted with very little screen time portraying unfunny, cliched and stereotypical stock-character roles like the paranoid, the closeted gay and the junkie, respectively. Then there’s also Peter Kwong who acts as an Asian janitor who only appears in the second half of the film just to be a typical American movie Asian with typical accent and happens to know kung fu. The film tries to be humourous offensive, but it never managed to cross the line between the people who’d absolutely love it and the idealistic ones who’d definitely despise it. The star of the show is perhaps the co-creator and writer of all James Wan’s horror flicks like Saw (2004) and Insidious (2011), Leigh Whannell, who has the most hilarious moments playing Doug, a socially-awkward science teacher. Whannell is also the co-writer of the film, which is probably why he gave himself the funniest lines. He’s perhaps one of the reasons why there are some decent scares (although the audience do have to forget that these are only children who could give you nothing more than minor illness) and graphically gory sequences (although the blood is a little light-coloured), while the hit-and-miss jokes must have came from the other co-writer, Ian Brennan, who’s the co-creator, writer and director of the high school musical comedy TV series Glee. The film may indeed be just another zombie comedy targeting teen audiences, but at least it’s fun enough with more than a couple of chuckles, which is a decent work from first-time directors Jonathan Milott and Cary Murnion. It tries to be self-aware at times like one of the beginning scenes where McBrayer’s character Tracy screams, “Who’s that lady? !” when an unknown extra gets attacked by a cootie-kid. The puns and satires are minimal — Wood gets called a hobbit as an insult, and an overconfident crossfit guy gets taken down — that’s all I could remember. Some gags work, the random tiny moments are funnier than the others, while some jokes are just completely unfunny and over-repeated, like the ones where Doug demands silence even when there isn’t any sound. The film doesn’t stick by its self-awareness too. There’s a kid-bully named Patriot (Cooper Roth) who goes around cutting off communication and power as though he knows what he’s doing. I know it’s a comedy, but come on, these kids are supposed to be brain dead as explained by Doug. The generic plot structure’s ending involves a risky escape through large number of the creatures (in this case, cootie-kids) before burning ’em down. The only surprise is that none of the main cast gets killed. 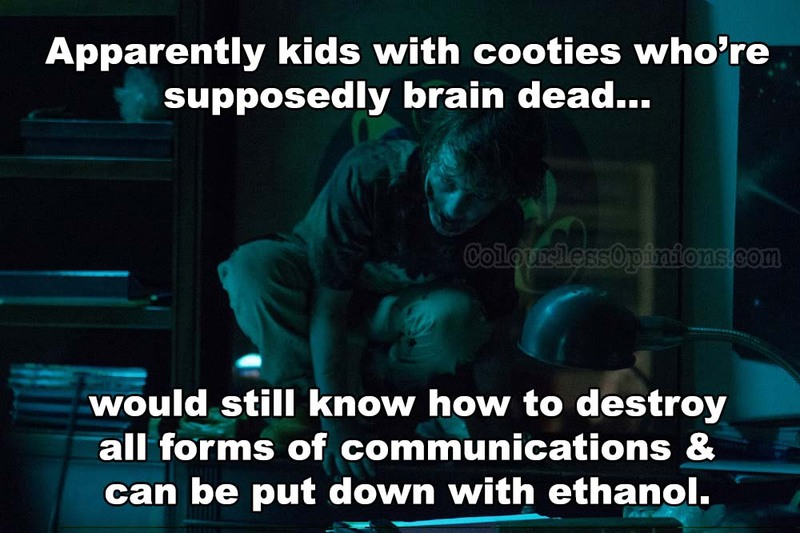 Simply put, Cooties is not as purely entertaining and unpredictable as other greater zombie comedies like Zombieland (2009) and Shaun of the Dead (2004), but thankfully, it’s way better than over-the-top horror parody flicks such as the Scary Movie sequels and the likes of it either. Post-credit scene: I didn’t wait to find out if there’s any but apparently there’s one where it shows Mr. Hatachi eating something while winking to the camera and finishing his frog and caterpillar story. Malaysia censorship: Nothing seemed to be censored at the press screening despite the few bloody graphic scenes and vulgarities involving minors, but it probably would be the same for the public as the film would most probably be rated 18 here. Second opinion: My girlfriend thought that it was quite funny as well. Verdict: Although the humour and purpose aren’t beyond typical teen comedies, it is still very watchable.